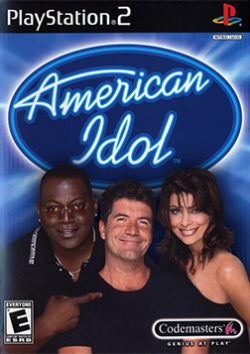 Game description: Complete with a computer generated Randy Jackson, Paula Abdul, and Simon Cowell, with trademark insults, American Idol is a music-based, rhythm-action game that will allow you to create, style, and train a contestant for the competition. Once styled and trained you'll see your contestant progress through the auditions, various heats, and then, hopefully, make it to the grand final. You'll need quick fingers as you match the right combination of buttons to what's displayed on the screen helping your contestant sing a sweet harmony and dance to the rhythm of the song. Get it wrong and your voice fades and goes out of tune as the judges and later the audience grow unsettled. Also known as Pop Idol (EU), Deutschland sucht den SuperStar (EU). This page was last edited on 3 February 2018, at 17:43.